Hans Christian Andersen, born April 2, 1805 in Odense, was a Danish writer and poet. In his early days, Andersen wanted to become an opera singer. In 1819 he went to Copenhagen to pursuit that dream. His voice, however, was too weak and he was accepted as a dance student at the Royal Theater. The Director of the Theater, Jonas Collin took him under his protection and remained his friend until the end of his life. Personally King Frederick VI was interested in the boy and arranged for him to study for free in the classical school in Slagelze. In 1822, even before starting school, Andersen released in his first book. He achieved a great success with "A Journey on Foot from Holman's Canal to the East Point of Amager (1829)," also published in German, and in 1833 received a travel grant from the king. That way Andersen made his first travels across Europe, visiting Germany, France, Switzerland and Italy. In early 1835 his first novel, named "Improviser", and later that year the first volume of Andersen's Fairy Tales, were released. In 1837, he created perhaps his most famous novel, "Only a fiddler". The short stories book "Album without pictures," released in 1840, brought Andersen even more success. In the style of the German romantics Andersen did a lot of travelling - to find himself in the world and the world in himself. In 1840-41, after visiting Germany, Italy, Malta and Greece, he came to Istambul and returned home through the Black Sea and the Danube. Andersen tells about his travelling experience in the book "A poet's bazaar." Almost until the end of his life Andersen traveled to countries near and far. He was kindly welcomed by his contemporaries everywhere he went - Heine, Hugo, Balzac, the father of Dumas, Dickens, composer Robert Schumann. 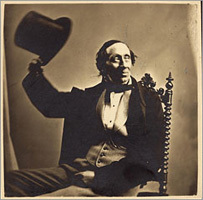 Andersen died on August 4th, 1875 near Copenhagen, crowned with a worldwide fame. Between 1835 and 1872 he created over 150 fairy tales and stories, later translated into about 125 languages. In his honor a monument that became a symbol of Copenhagen - a bronze statue of the little mermaid, was erected. The most prestigious award in the world of children's literature is named after Hans Christian Andersen.